As a railfan and rail traveler, I have found that a cross-country train trip is something that truly has to be experienced at least once to see just how much fun one can have. This trip went from a neat idea to a reality in a matter of about 4 days! Most people spend several months to a year or more planning a vacation. I had 4 weeks. I knew I had some vacation time coming up from work. Amtrak, probably in an attempt to boost ridership in the Winter, had several cheap tickets available, if you know where to find them. I also have family about 10 minutes from Fullerton. My Aunt and Uncle were happy to have me stay there for the 4 days I would be there, so now, all I had to do was wait 4 weeks for February 21st to get here! I purchased the tickets for this trip over the Internet from Amtrak's web site. 3 of my 4 initial tickets were "Rail Sale" tickets with the 4th one an Entertainment Book Coupon Discount ticket. My total cost for the round trip from Buffalo to Fullerton was about $233. 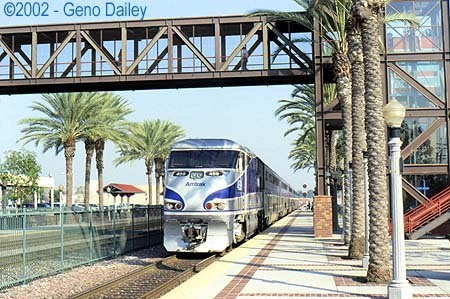 My tickets aboard the Pacific Surfliner trains that I took to San Diego cost $34 round trip. These were all "Coach" seats so I didn't have the luxury of a sleeping car but I really didn't care. I was about to take a trip cross-country on Amtrak and just the fact that I was there was enough!! !